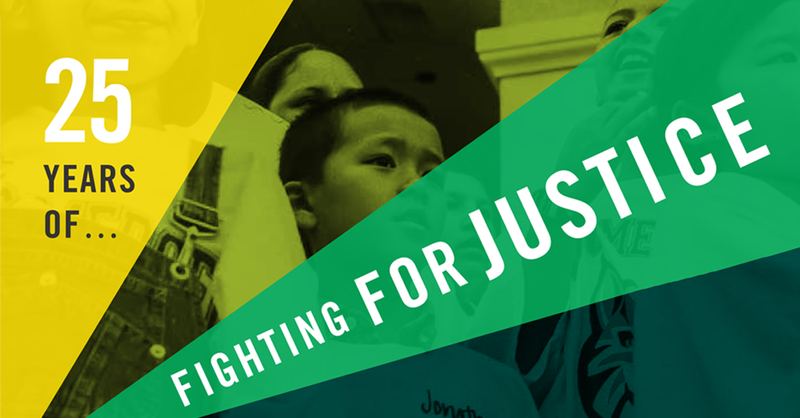 Over the last few months, as The Greenlining Institute has marked its 25th anniversary, we’ve been reflecting on our history, accomplishments, and occasional frustrations. And let’s be honest: The 2016 election upped the frustration level, with almost everything that matters to communities of color coming under attack in the past year and a half. And yet I feel increasingly sure that we can achieve racial equity and that California – and Greenlining – will help lead the way. Yes, powerful forces threaten civil rights, the social safety net, organized labor and sane environmental policies, but we must fight the temptation to get into a defensive crouch. That’s not to say we shouldn’t fight back – we are, with California proudly in the lead – but fighting back is not enough. We must also put forth an affirmative, inspiring vision of racial equity backed by practical steps to get us there. And this is where our history comes in. We’ve seen that when we lead with equity, all benefit. Racial equity isn’t a barrier to progress, it’s the essential ingredient. And California, where communities of color have been the majority for years, can lead the way. As we look to the future, we see new and emerging challenges. Technology, for example, can connect the world but also raises the specter of digital redlining – in which electronic algorithms replicate and spread old patterns of racial exclusion and stereotyping into new areas. Greenlining has a lot of experience engaging the corporate sector that we must bring to bear in this notoriously non-diverse sector of our economy to create true win-win solutions to the challenges tech creates, while opening the doors to the tech economy for communities of color. The lack of diversity in what has become California’s leading industry is one of the reasons we’ve felt a need to ramp up our work on diversity and inclusion. We must build on our longstanding work in areas like supplier diversity to ensure that communities of color have full access to jobs and opportunities in every aspect of our economy. Our Diversity and Inclusion team’s recently-released Diversity, Equity and Inclusion Framework represents the first step in our drive to reclaim diversity and inclusion for jobs and justice. And, particularly in California, the cost of housing has become a crisis that threatens everything we hope for – making homeownership nearly unattainable, placing crushing burdens on renters, and driving increases in homelessness and child poverty. Because of America’s persistent racial wealth and income gaps, these hardships fall hardest on communities of color. Homeownership has long been in our portfolio of issues, but we must push harder for innovative, creative solutions to what’s become a true emergency. I feel great pride in what Greenlining has accomplished over the years, bringing some $600 billion in investments to communities of color through negotiated agreements and legislation, and bringing jobs and entrepreneurial opportunities to neighborhoods that had far too little of either. But present and future challenges demand that all of us working for equity become more creative, more visionary. We should learn from the young people who increasingly lead the way. Youthful energy and determination have propelled the movement for Black lives and the March for Our Lives campaign for gun safety as well as the Me Too movement against sexual harassment. The Dreamers have inspired us all as we stand up for immigrants. At Greenlining we’ve invested deeply in young people through our Leadership Academy, which has trained 1,000 young leaders, many of whom now hold influential positions in business, government and the nonprofit world. Those alumni – and the many more who will follow – will help lead communities of color toward the future. California has led the nation’s fight against climate change, and we’ve also led the effort to build racial equity into climate solutions. We must stay in the lead, but we also have to broaden our lens. For example, our state has begun important discussions about climate resilience – the need to prepare for the challenges that a changing climate is bringing us in the form of extreme weather, droughts and floods. We plan to make sure that conversation goes beyond just addressing facilities like roads and seawalls but also ensures that we build resilient communities that don’t just survive but thrive in a changing environment. Ultimately, communities must be central to this vision of 21st century racial equity. Diverse cities serve as fertile ground for innovations that can be scaled up across California and the whole nation. They’re also where communities of color lead, holding elected officials more accountable and attuned to the needs of their communities. In the upcoming years, we will work with cities and counties to build a bold vision for “greenlined communities.” We’ll be engaging more actively in our own backyard here in Oakland, but also providing technical assistance and support for local policy initiatives across California. None of this will be easy. We’ll have to be bold, break out of silos, collaborate with allies who may seem like unlikely partners, and always let our communities be our guide. 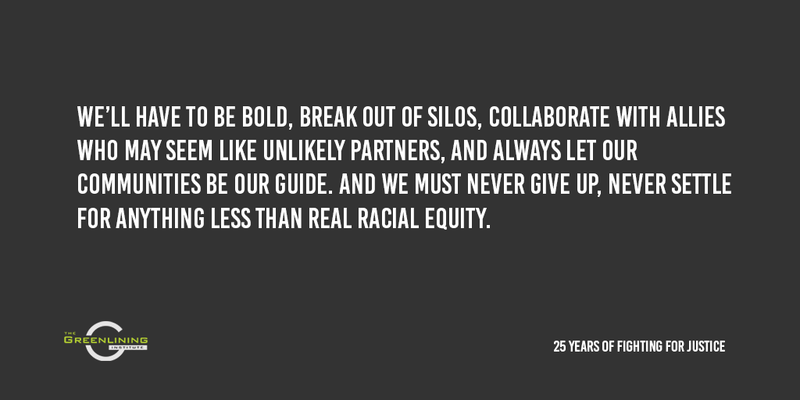 And we must never give up, never settle for anything less than real racial equity. That’s a heavy agenda. But when I go home from the office every day and look at my three kids, I know what kind of future I want to leave them, and we’re more determined than ever to get there. Orson Aguilar is Greenlining’s President. Follow him on Twitter.